They are incredibly smart, cuties, our best friends and even family members … But let’s face the truth: we could do well without their smell! Unpleasant odors from the animals may remain the main memory for the guests of your home, even if its interior is astonishing and thought out to the last detail. How can this be avoided? We are ready to share our experience with you. Clean the house more often. 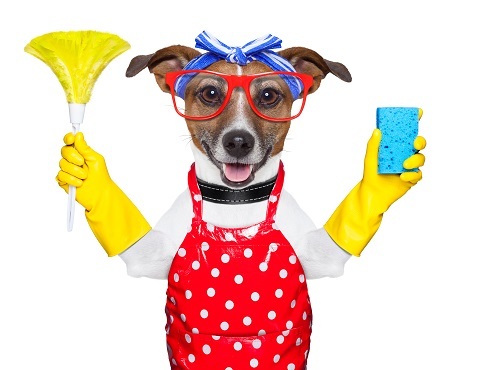 The pay-off for a life together with your charming pet is an objective necessity to do the cleaning more often. This is the harsh reality! Keep your pet clean. Do not be afraid to wash and comb your ward; take it to some specialized hairdresser’s parlour. Pay close attention to the state of their claws and teeth. It takes effort, but it can dramatically change the situation with the smell. Things of your pet must also be clean. The bedding, toys, bowls, cages, litter box – all this must be regularly washed, laundered and cleaned. Select an effective litter. Various kinds of litter, well absorbing unpleasant odor, are now in the market. Try different brands, compare, and change the contents of the litter box more often. A personal litter box for every cat! This slogan is approved by a variety of specialists. It is proved that the smell decreases, if, for example, three cats have three different litter boxes. Add some baking soda into the tray. It also helps to fight down the unappetizing smells in your home. Air the house more often. Regularly arrange a good draught in your house. Don’t let the air to stagnate! Deodorize the floors. To relieve the carpets from the penetrated smell, sprinkle them with some baking soda a couple of hours before vacuuming. Or better yet — get rid of textile and confine yourself to solid, easy-to-care flooring. Your choice – furniture made of metal, glass and leather. Textile upholstery and wooden furniture is much more vulnerable to the onslaught of your pet. Choose stronger materials that do not absorb odors. Reconsider your attitude to rugs. No high pile. No excessive complexity in care. And of course, no expensive and unique floor rugs! Instead of being angry with your pet, which ruined an expensive rug, buy few cheap ones and replace them upon destruction. Cannot get rid of the smell? Mask it away! Solution in case of emergency – carpet fresheners, aroma lamps, scented candles and mixtures for house odorization.